I love holidays and birthdays. Growing up, Easter Sunday centered around Bible reading, family, and delicious food, and I dreamed of similar Easter family traditions with my own kids. When my oldest was just a baby, we moved out-of-state. After several years without family nearby, I realized that “stuff” had replaced family fellowship for my kids, and holidays had fallen into the “What Will I Get” category. About four years ago I felt sick inside when my kids woke up on Easter morning, and were not willing to do anything besides hunt for Easter baskets. I had tried to draw their attention to family devotions so we could read about the ultimate sacrifice first, and they were completely uninterested. All they wanted to do was collect their treasure and hide out in their rooms to enjoy it. Where was the fellowship? Where was the desire to know God that I had been carefully fostering for years? These were NOT the Easter family traditions I'd always envisioned. I wanted to have a real, meaningful Easter, but it just wasn't happening. This was not a reflection of them – they are kids! They were following my lead, and for years I had conditioned them to be all about the Easter basket, and the Easter eggs, and a dozen other things before any mention of the true meaning of Easter. I even felt like I was doing a halfway decent job of teaching them about Jesus, and how He died for their sins, and going through the scriptures with them. But on that morning, faced with plastic grass and eggs, their focus was always on self-gratification instead of Jesus’ death and resurrection. It’s not wrong to enjoy those other traditions, and I know that I have 365 days in a year to teach my children about Jesus, but I kept thinking that if we didn’t have even a basic recognition of why we celebrate, why do it at all? The following year I put together much smaller Easter baskets, with simple things like a pair of socks for each kid, a few pieces of candy, and a worship CD for them to share. I loved their reactions (they were so thrilled and thankful, and I had spent $12 on all of the baskets combined! ), but it still seemed like something was missing. They were still so distracted by the traditions that they didn’t seem to really understand why we celebrate Easter at all. Some friends of mine completely opposed any mention or celebration of Easter, but I felt like that would be going a bit too far in the other direction for my family. After prayer and discussion, my husband and I decided to continue with the Easter baskets. Ha, I bet you weren’t expecting that! We decided that some traditions are fun and harmless, like hunting for eggs at Easter. But we decided that instead of doing the holiday traditions on the holiday, we would do them sometime in the week before. That is why we have fun with the Easter traditions on Saturday, and Resurrection Sunday is all about Jesus and spending time with family. This minor change has brought me a lot of peace. Saturday is a fun day, decorating eggs, handing out minimized versions of Easter baskets (sans the impossible to vacuum plastic grass), and preparing yummy food to eat the next day. But Sunday is Resurrection Sunday. Sunday is a more reverent and joyous celebration of Jesus’ resurrection, and we stay focused on healthy family fellowship and thankfulness for Jesus’ ultimate sacrifice. This is what works for my family, and I’m very thankful to have a way to enjoy the fun traditions and follow them up with some deeper instruction and reverence. This three-year-old tradition has become something the kids really look forward to, and I feel like they get so much more out of Resurrection Sunday because of it. 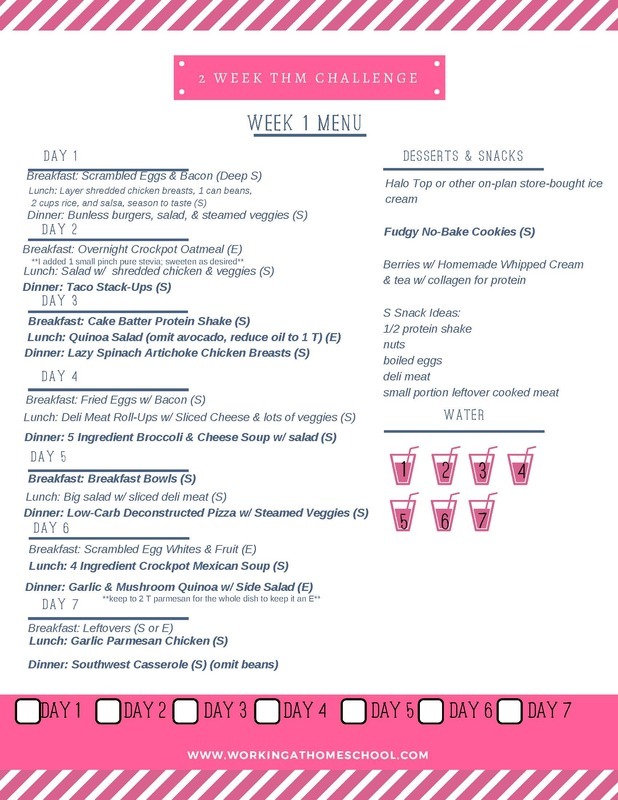 « NEW Printable Shopping Lists for 31 Days of Trim Healthy Mama Meals! My children are now grown and married with childtene of their own. I started this same tradition when they were little. Saturdays were always a lazy morning at home when they could play in their pj’s and enjoy their basket treats with a new game or book to dig into. Sunday focused on church and sharing Jesus ultimate sacrifice for us thought the day with family and a special meal. It really did take the pressure off me as a Mama trying to get it all done on Sunday morning and allowed us to enjoy a full weekend of celebration. Thanks, Tina! I love that your family was able to enjoy their Easter weekends so much! I love your solution of having the Easter baskets on Saturday, and focusing on Sunday, the real reason why we celebrate Easter. Making Jesus the center of attention. Good job Jen. Thanks for reading and taking the time to comment, Melissa! I appreciate it! I’m so glad this sounds like a good idea to you. It’s made a big difference in my kids’ attitudes! We do the same thing with all the holidays that fall on the Lords’ day. We make the Lord’s Day His, but still do the family traditions. We just came back from out huge family gathering where hunting eggs was the center of the fun. Tomorrow we will gather to worship out Lord with out minds on Him and not the worldly stuff. I really enjoy your recipes. Learning to be THM. Love it! Thanks for sharing, and for your encouraging words, Joan! We also did baskets on Saturday. I would make it a treasure hunt. I hid written clues to lead them to their baskets. It made the fun last a little longer.